With equipment from 13 professional racing teams airlifted from the United Kingdom, the Formula 1 tour opens for the first time at Bahrain Grand Prix, setting the official benchmark for the 2010 grand prix season. Even before the exotic Formula 1 cars took the track en mass for the first time in the 2010, driver news and team structure changes has supplemented a gossip-worthy off-season. For those who prefers to indulge their sights to the wild howls of the ultimate open wheel racing cars, the day one practice at the 6.299 kilometer Bahrain circuit finally delivers 24 Formula 1 drivers prepared for motorized battle. With top speeds extending into the 300 km/h range at the end of three straight sections, the Bahrain race track challenges the drivers through 23 turns with several designed to promote passing opportunities. 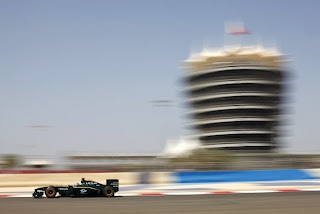 With day one providing two one-hour and a half opportunities to the 2010 Formula 1 teams to shake off cobwebs, the first practice of the year summoned quite a dumbfounded feeling to grand prix observers. Adrian Sutil set the top time driving the Force India-Mercedes around the Bahrain circuit in 1 minute, 56.583 seconds in the late morning practice. Under two-tenths of a second behind Sutil, Fernando Alonso showed immediate command of his new Ferrari. With the veteran Ferrari driver Felipe Massa placing fourth fastest, the red cars wearing the prancing horse badges are determined to reverse the sub-par performance in 2009. While departed F1 driver Kimi Raikkonen prevented Scuderia Ferrari from going winless last year with a top podium finish at Belgium Grand Prix at Spa, the team's season started slowly in 2009 going scoring points for the first three event. In fact, at was the Bahrain Grand Prix of 2009 that allowed Ferrari to break the streak. Sandwiched between the Ferraris was Robert Kubica piloting the Renault ride Alonso recently vacated. Flying around in third place, Kubica vastly outpaced rookie Renault F1 teammate Vitaly Petrov mustering only a 16th fastest time. As the Force India car topping the time chart through the first Bahrain warm up, another surprise through the first practice was the apparent lack of speed shown by some 2009 Formula 1 front-runners. McLaren, Mercedes GP (formerly constructor champion Brawn GP) and Red Bull Racing were slower through the morning session. 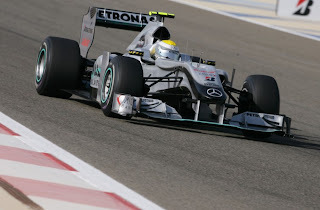 However, practice session 2 at Bahrain would allow these established teams to resurface. 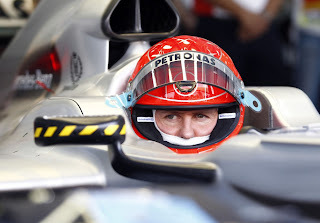 Through the first day of preparation for the Bahrain Grand Prix, many eyes were on the Mercedes GP team who not only took over the former Brawn GP team but fostered the return of 7-time Formula 1 Drivers Champion Michael Schumacher. While Schumacher's first practice netted only a 10th fastest time, the German would pick up 7 spots through the quicker afternoon session. Schumacher's younger teammate Nico Rosberg put the Mercedes F1 factory team out front with a lap 1.2 seconds faster than the top mark set in the first practice session. With Mercedes GP making strong showing in session 2 shake downs with 1st and 3rd quickest times, McLaren-Mercedes (effectively downgraded to an engine customer as Mercedes-Benz plans to sell-back their McLaren ownership by 2011) filled out the top-4 as their drivers Lewis Hamilton claimed 2nd fastest and Jenson Button rested in the 4th spot. 2009 championship contender Sebestian Vettel brought the Red Bull Racing team forward on the second time chart. After winning the first practice session, Adrian Sutil could only bring his Force India-Mercedes up to 12th in the second practice. While Sutil was unable to back up the underdog effort in the afternoon of day 1, two drivers made some remarkable laps worth earning recognition. F1 Rookies Nico Hulkenburg for Williams F1 and Vitaly Petrov driving for Renault F1 placed 6th and 8th respectively. As for the three new teams to Formula 1, their freshman initiation has been harsh. With Lotus Racing, HRT F1 and Virgin GP resting at the bottom of both practice sheets, these cars were 5 seconds or more off the pace. While the Virgin-Cosworth of Timo Glock led the 6-car grouping in the first practice, the Lotus Racing team was fastest in the second practice led by Heikki Kovalainen. In both practice sessions, the HRT-Cosworth of Formula 1 newcomer Karun Chandhok laid dormant started by hydraulic problems in the first session. After three hours of day 1 practice, the widespread differentials on the time sheets has yet to pinpoint a single or smaller group of race teams who will be the rabbit for 2010. While in both practice sessions the Formula 1 teams were making honest efforts, it's important to note that there was varying capacities of fuel being carried by certain cars as they calibrate for qualifying as well as race setups.